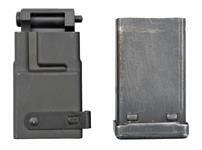 Stock, Black Laminated, Left Hand, Long Action | Gun Parts Corp. 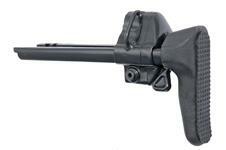 Complete your MK-VII Rifle with this laminated stock by USA Wood Inc. Features deluxe checkering, cheekpiece, satin finish, rifle pad, guard screw bushings and swivel stud holes. The stock is inletted for a blind magazine and side bolt release. The barrel channel measures 1.27" wide just ahead of the recoil lug area and tapers to 0.78" wide at the tip of the stock. Note: The MK-VII is a controlled-round center-line feed bolt action rifle built on a Savage 10/110 platform minus the use of a barrel nut. Left-handed stock. Action screw holes measure 5.062" on center.